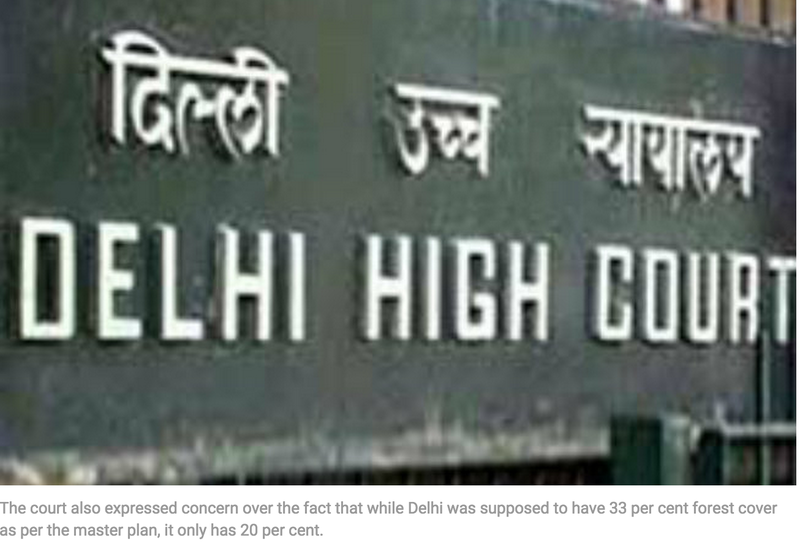 “Delhi High Court today expressed serious concern over high levels of particulate matters in the air affecting the health of the people in the national capital and directed the city government to take steps to check unregulated building activities and plant trees. A bench of Justices Badar Durrez Ahmed and Sanjeev Sachdeva said the source of the particulate matter, which is a “great health hazard”, was unregulated building activities as well as debris left on the road by civic authorities after carrying out repairs of streets. Taking a serious view of roads being dug up any given time and left uncovered, the court directed the civic bodies to ensure that repairs are carried out with “reasonable speed” and the debris removed promptly… The court also expressed concern over the fact that while Delhi was supposed to have 33 per cent forest cover as per the master plan, it only has 20 per cent. It also sought details from the forest department on how much money it has collected from permitting cutting of trees and listed the matter for further hearing on August 5.” NDTV. Read it on delhiair.org.